Book your visit to The Fort Collins Escape Room. Got that new room done? Photos from the Fort Collins Escape Room. We now have two escape room adventures! Escape From The Machine and Mission to planet X. We're thrilled to have two of northern Colorado's premier escape room experiences here at The Fort Collins Escape Room! 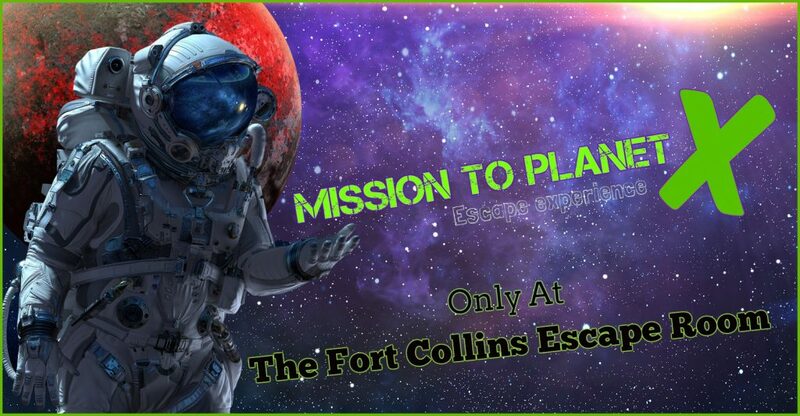 Escape from the Machine and our new much anticipated experience, Mission To Planet X, Fort Collins first SCI-FI themed escape room. You'll have 60 minutes to solve the mysteries and puzzles in our rooms, they will surely challenge and test your skills in problem solving, critical thinking, deductive reasoning and other big words we can't even pronounce! Escape Rooms are exploding in popularity right now, keep in mind not all rooms are created equal. Here at The Fort Collins Escape Room - we have built a fully immersive environment to host our games, making your team feel like they're living the adventure. The Fort Collins Escape Room! The Fort Collins Escape Room, has two vastly different escape room experiences. This escape room adventure has been a big hit with players. Set in a Victorian steampunk world that’s full of locks, clocks and hidden passages. Escape From The Machine is a story of a world traveler turned time traveler and his quest to save his wife and his world! Escape From The Machine will challenge and entertain players of all skill sets from first timers to seasoned escape room players! For pricing and to book your visit click here. Fort Collins first Sci-Fi themed escape room! This out of this world escape room will challenge your team to save earth from an alien invasion in a elaborately themed spaceship environment! From the mystery of the missing crew to the alien specimens and real Laser Maze, this out of this world adventure will create a unforgettable experience for all who dare to join the risky Mission To Planet X! For pricing and to book your visit click here. We have a new adventure for ye! Bookings will begin June 2019 for our medieval themed escape room! It is one thing to read about dragons and another to meet one! We would like to sincerely thank all our guests! The support you have given The Fort Collins Escape Room has inspired us to create more fun and exciting escape adventures for you in the future! What to do in Fort Collins?The Fort Collins Escape Room is a perfect activity for families, friends and company team building! If you’re coming to visit Fort Collins make us part of your visit, everyone will think you’re a genius for finding such a unique activity! Ready to book? Just click on our booking contraption below, it’s so easy.